Greetings all, this is the 4th (and likely final) iteration of this guide and has been updated to account for the changes up to the “Night on Endor” patch (There have been changes in the order of the top heroes & villains, with one additional villain finally cracking the top tier!). This guide functions as an overview of what I think are the top heroes & villains worth upgrading for Galactic Assault. Due to the changes in the progression system, the importance of picking the correct cards has been greatly reduced which is why I don’t think I will develop this guide further; however, it will still be helpful for newer players to have a guide on which cards should take priority when using the newly implemented skill points system. This post is based upon my experiences after playing 1100+ hours of Galactic Assault (only mode I have played) as of today, as well as my personal game-play preferences. This is not to say that other heroes & villains cannot be viable or worth upgrading; however, I think that these heroes & villains are on a tier by themselves as far as their power to influence Galactic Assault once they are fully upgraded. 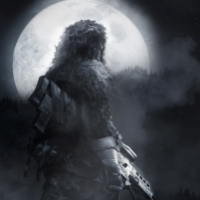 I have included breakdowns of the characters playstyle, pictures of their loadouts, as well as videos of matches using each hero & villain so you can see firsthand how to utilize them effectively. These “rankings” are mostly relative… while I think that Palpatine is the best Villain and Rey is the best Hero, all the rest of the heroes and villains in the top tier are completely viable if played well… the ranking order is basically just based on my personal preferences. Finally, the star card builds I listed are not the only viable builds for these characters. While most of them have what I would consider a single optimal build, several such as Yoda have other viable variations which I just personally don’t prefer. The ones I list as “ideal” are just the variations I find work best for me in most situations. Finally, I have filmed all new gameplay videos for every hero & villain for the Night on Endor patch, so this gameplay is current as of 5/7/18. I filmed all these videos over the 2x point’s weekend so some are better than others, but they give a good representation of what you can expect from each character and how to use them effectively. Emperor Palpatine has returned to his perch atop the heap of the best villains for Galactic Assault largely as a result of the nerf's to Darth Vader in recent patches. Palpatine excels at destroying Jedi heroes, as well as clearing entire teams of troopers who are bunched together. His movement speed, coupled with his ability to stay at range, ignore shields, burn through blocks, heal himself (most powerful heal in the game with chain lightning + lighting absorption card), and generally be incredibly elusive makes him an absolute game changer in Galactic Assault in the right hands. His only real weaknesses are enemy vehicles, or enemy blaster heroes who he cannot evade; but at this point in the game, most people play Jedi heroes, which only serves to amplify his power in those games. The best advice for playing Palpatine effectively is to hit and run, stick and move, whatever you want to call it. 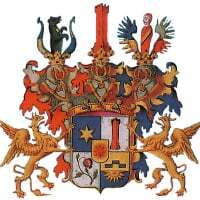 You do not stand and fight with people toe/toe... you use your mobility to destroy enemies and then get out of harm’s way to do it all over again. 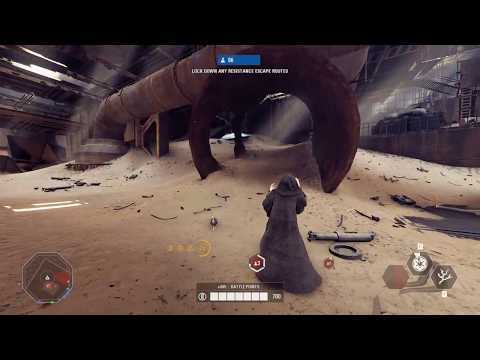 The biggest caution I would say is to avoid large open areas where you cannot duck behind cover, and avoid getting into shooting matches with Wookiee warriors and blaster heroes without dodging in and out of cover. Additionally, his electrocute stun ability is a high risk ability unless you have flanked the enemy as the casting animation makes it impractical to use in most situations without taking significant damage. You also do not want to get into melee range with even regular blaster troopers as your attacks will bug out and not hit and you can be melee'd to death... stay at range, use dash and jump properly and you will dominate. Alternate Loadout: None, I think the loadout above is basically optimal. Bossk remains the second best villain in Galactic Assault to Palpatine, largely based upon my own personal gameplay preferences. 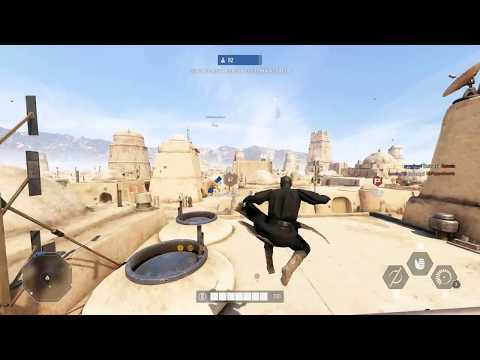 Bossk is an interesting villain as he is the only hero/villain in the game who has the ability to passively regenerate his entire health pool by default (he never takes permanent damage due to being a Trandoshan) as well as being the only non-Jedi/Sith to possess a high jump. He also has a very unique ability set in that all three of his special abilities can function as area denial abilities. 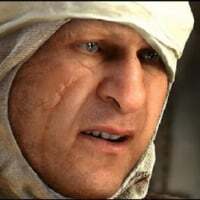 His gas grenade hits through walls and does significant damage to anyone caught in it, his traps can 1 shot all troopers and severely injure heroes, and his “Predator Instincts” ability allows him to see through walls and launch micro grenades at targets (although in multiplayer the heat signatures don’t always show up and the grenades are hard to aim at anything but point blank range). Couple all these attributes with an awesome semi-auto blaster which is great at all ranges (and can 1 shot some troopers if fully overcharged) and he is a very dynamic character to play and can excel in all maps/environments. My best advice for playing Bossk would be to use him more defensively… while you can certainly push the line of engagement with him, I prefer to play just behind the line of engagement supporting the troopers as they form the front line with my gas grenades and grenade launcher. 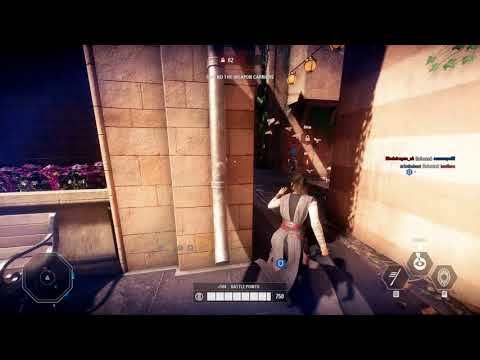 If there are any objectives or choke points, you can place your mines at those locations and completely lock down an area from being retaken or attacked without some enemies being killed (even Jedi heroes like Rey/Luke/Yoda will have difficulty with Bossk due to his kiting/high jumping + his mines and gas and explosive micro grenade spam). 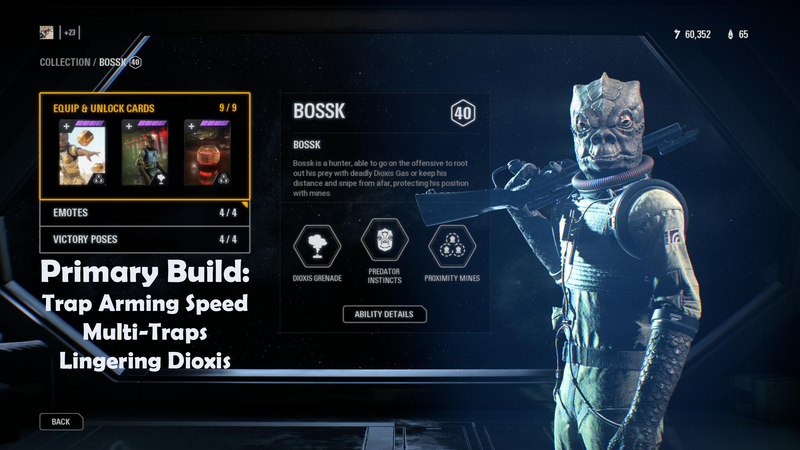 My biggest caution for playing Bossk is that in general you will want to avoid toe to toe shootouts with enemy blaster heroes as he is vulnerable due to his slow rate of fire and lack of any temporary shield or health buff. Also, you will want to avoid getting into shootouts with groups of enemy troopers as his health can be burned very quickly. Basically, treat him like a super powered enforcer and you will do well. Oh how the mighty have fallen! 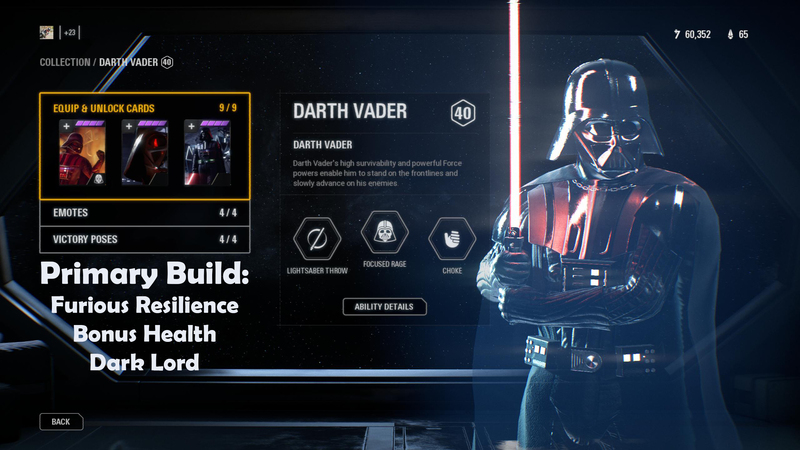 Lord Vader enjoyed a short stint atop the villain totem pole, but with the recent nerfs to both Furious Resiliance (55% damage reduction to 25%) and the reduction in his base health, he has lost some luster; however, he certainly can still take over matches with skilled play. Darth Vader plays exactly how he is in the original trilogy of films... slow, calculating, and unstoppable (remember, Vader doesn't lose a fight from when he first chokes the dude in A New Hope until he is finally defeated by Luke in Return of the Jedi and only when Luke gives in to the dark side at that). Vader when upgraded has the most health of any hero or villain in the game with the ability to boost it further with his focused rage ability... bonus damage, infinite stamina, and 25% damage reduction with focused rage active and access to healing through his star cards... couple this with his saber block, saber throw which can 1 shot all troopers, the highest per swing saber damage in the game, as well as a force choke and you have a powerful objective taking machine. Vader excels at pushing the line of engagement and soaking fire for his team while the rest of the troops mop up the heathen rebel scum as well as capturing or defending objectives in the midst of hails of blaster fire and forcing heroes to run for their lives with his mere presence. 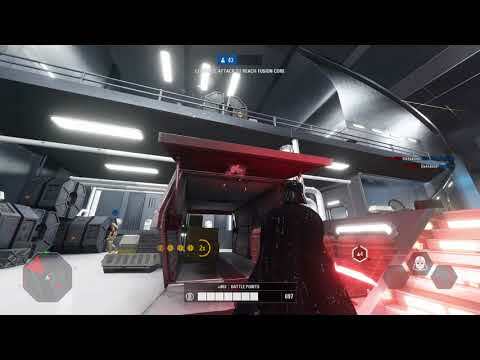 The best advice I can give for playing Vader effectively is to stick with your team, keep saber block/focused rage up as much as possible, and push the line of engagement (random players will follow Vader in the game... he has that much presence! ), slaughtering enemy heroes as they arrive and dealing with any pesky rebels who dare to approach (Vader can kill all the alliance heroes in single combat due to his combination of health/buffs/damage). The biggest caution I would say is do not over extend chasing a lone enemy who is rolling around, and do not allow yourself to get flanked as Vader has low mobility compared to others. Lastly, be careful using his force choke unless you are sure you can catch everyone in it as it leaves him vulnerable to blaster fire. Darth Maul remains in 4th place for the villains despite a strong showing from the recently buffed Iden Versio. Maul hangs on to the 4th position largely due to his ease of use and his fantastic mobility which makes him much more forgiving to play than Iden. Darth Maul is the only hero/villain on this list who lacks the ability to heal or health buff himself, which is compensated for by his mobility and his great move set. 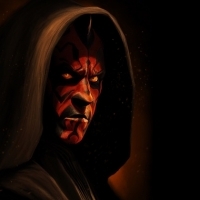 Darth Maul functions as a melee version of Emperor Palpatine, in that he is a hit & run workhorse (after all, he is a Sith Assassin). Since he cannot heal, the best star cards for Maul reduce the damage he takes from blaster fire, and grant him extra spin attacks and reduced spin attack cool-downs because he can actually deflect blaster fire while he is in the spin attack animation. The best advice I can give for playing Darth Maul effectively is to constantly be on the move searching for openings, use his spin attack to jump into/through groups of enemy troops, and then use it to immediately leave the area. Couple his spin attack with his force throw and his mediocre saber throw (compared to Vaders at least) as well as his great speed/mobility and you have a pretty good package for someone who likes to run and gun but prefers a saber wielder over the Emperor. Additionally, you generally want to avoid getting involved in toe to toe fights with enemy Jedi as you will suffer significant health pool degrading... instead you want to spin attack through them, use force throw/saber throw on them, and stay at range until spin attack is again available... or you can wait until they are engaged with someone else and then assassinate them! 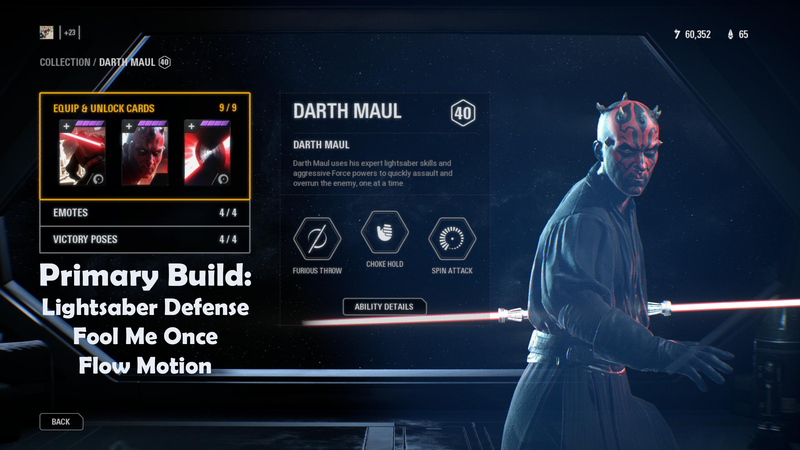 Alternate Loadout: Accelerated Throw, Lightsaber Defense, & Flow Motion (Slightly increase the damage of saber throw at expense of spin attack cooldown time… I don’t prefer this as his saber throw is hard to aim, it already does 300 damage if it hits both ways, and spin attack is Maul’s only blaster deflection ability… I want it up as much as possible). I am very excited that we finally have some fresh blood into the top villains so there is actually decisions to be made! 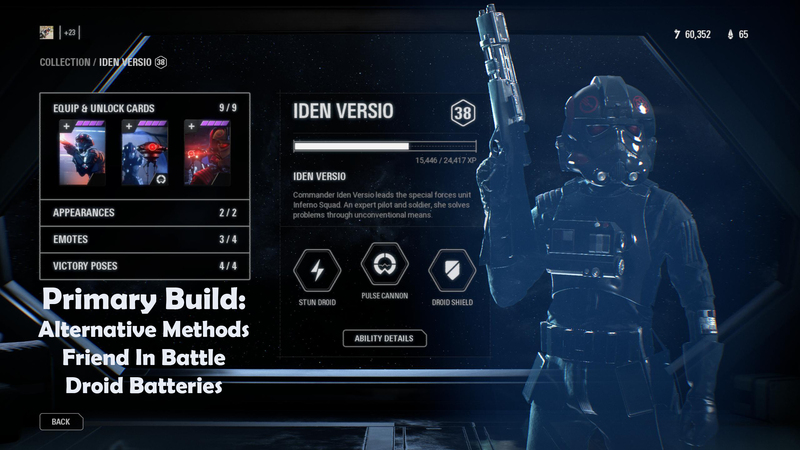 Iden climbed into the mix largely due to the addition of an ability for her to heal using her droid stun ability. She is a interesting villain to play in that she is relatively weak and has poor mobility which she makes up for by having probably the 2nd best blaster in the game (after Leia's pistol). Both the primary and secondary fire of her blaster can rip through enemies incredibly quickly. In addition to her blaster, she has the ability to deploy a small droid who can shield her and also allow her to stun enemies in a cone in front of her. Finally, she has the ability to turn her blaster into a sniper weapon, although I personally have found this ability to be rather lackluster. 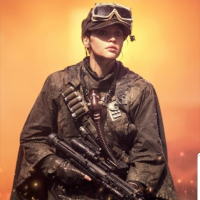 The best advice I can give for playing Iden is that you cannot treat her as a typical hero/villain, instead treating her almost as an overpowered trooper. Her health can be burned very quickly and she has limited mobility. I would say play Iden as you would play a Heavy trooper, moving from cover to cover and pushing into CQC when your CD's are up. Also, make liberal use of her alternate fire splash damage to clear around corners or 1 shot troopers. 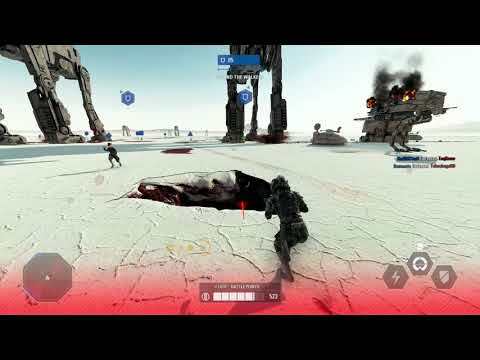 Iden is also particularly adept at killing heroes due to the power of her stun, and if you land a stun on a hero, you can usually kill them without much difficulty. Finally, if you do find that you have lost some life due to her poor regen, you can use the droid stun to replenish even permanent health damage, thus the reason to use the Droid Batteries card to maximize your healing, stun and shield potential. Rey maintains her top spot as the best Jedi hero at this point in the game. Her power comes from her movement speed, swing speed, and her set of abilities. She hits the hardest of any Jedi with her saber, as well as having the ability to charge through groups of enemies/heroes with a highly damaging knockdown attack. Additionally, her mind trick ability can function as a death sentence to enemy villains who get caught with it; however, all these attributes pale in comparison to her Insight ability. 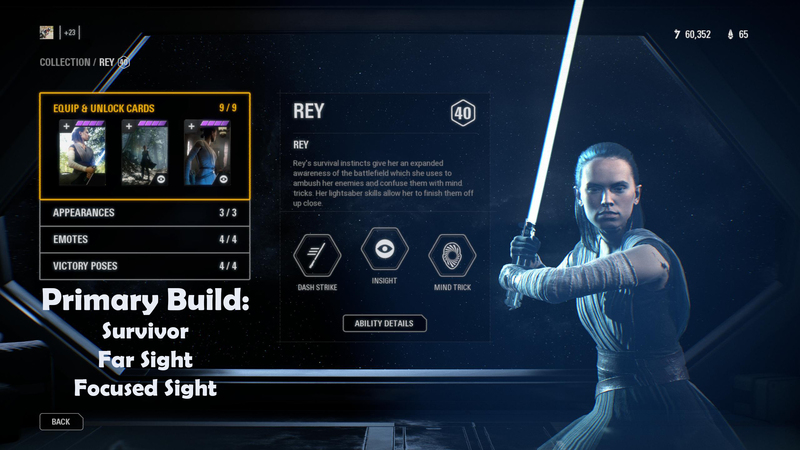 Insight functions as a team wide wall-hack which reveals all enemies within range through walls... in addition, it also hides Rey on the radar for the duration and increases her saber damage while giving her limitless stamina... 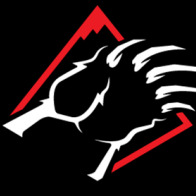 This is the most powerful ability in the game at this point even after multiple previous nerfs. 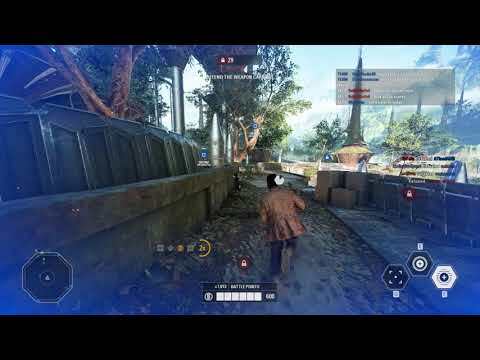 The best way I have found to play Rey is to function as a team wide wall-hack bot, while also assassinating enemy heroes who enter the area. Because Insight allows Rey to always have the knowledge advantage and removes her from the radar, she can nearly always open up on enemy villains with her saber charge into a saber strike combo, follow that up with a quick mind trick and the villain is done for. She can single-handedly change the outcome of games in a similar way to the impact Vader has for villains; only in the case of Rey, she relies on her team being able to take advantage of the wall-hack, while Vader can dominate without as much need for his team. 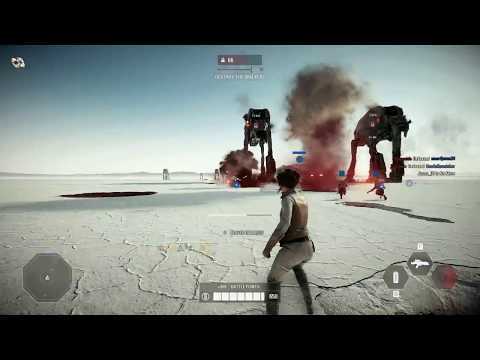 The biggest caution I would say for Rey is similar to Vader... do not get caught up chasing someone and over-extend... be cautious and methodical with your movements, pick your spots to engage, and the rest of the time soak fire with saber block and function as a wall-hack bot for your team while assassinating unaware villains. Princess Leia is currently the best & most well rounded blaster hero/villain in the game. Her default blaster can 1-2 shot troopers, she has the ability to heal (with star cards), she has an incredibly powerful team shield which is great for taking/protecting objectives, she has a flash grenade to hassle enemies, and finally her alternate fire can 1 shot all troopers in the game, deals heavy explosive damage through saber blocks, and has homing capabilities in medium to long ranges against both troopers and aircraft (on aircraft it will actively follow them like a guided missile and will do 75% of health in a single shot on a Tie Fighter). The best way to play Princess Leia is to stay at moderate ranges (if you are a good shot you can do exceptionally well in CQC, but this requires a higher degree of skill than most players have) supporting your team with anti-air/anti sniper alternate fire spam; push objectives with your team to support them with flash grenades and group shields, and to destroy villains other than Vader and Kylo who can block her short range blaster (she can destroy Palpatine/Maul and other blaster villains without issue). 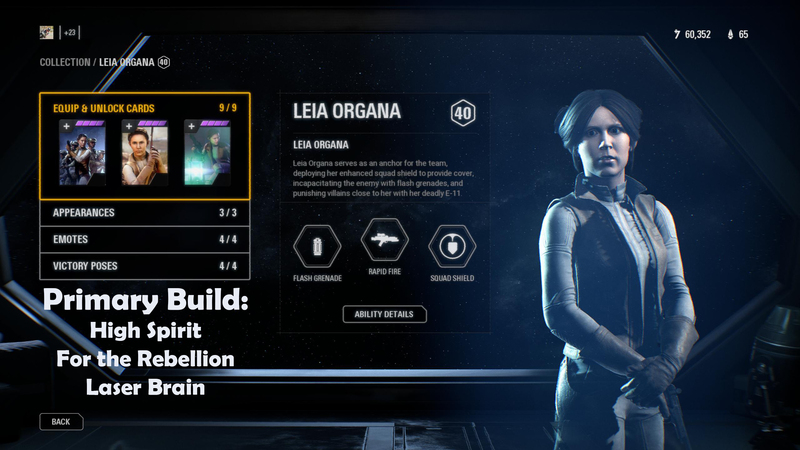 The biggest caution with Leia is to always be aware of your surroundings and don't let someone like Vader get into melee range as you will probably have a bad time due to having relatively poor mobility compared to other heroes and villains. If you do find yourself in this situation, drop your flash grenade, and attempt to retreat/roll out of melee range. Yoda is an interesting saber hero in that he lacks the ability to saber block. Instead; his block ability is actually a force absorb ability which functions to absorb enemy blaster fire as well as force powers like lightning attacks. The more power that Yoda absorbs, the larger the radius of his unleash ability becomes. 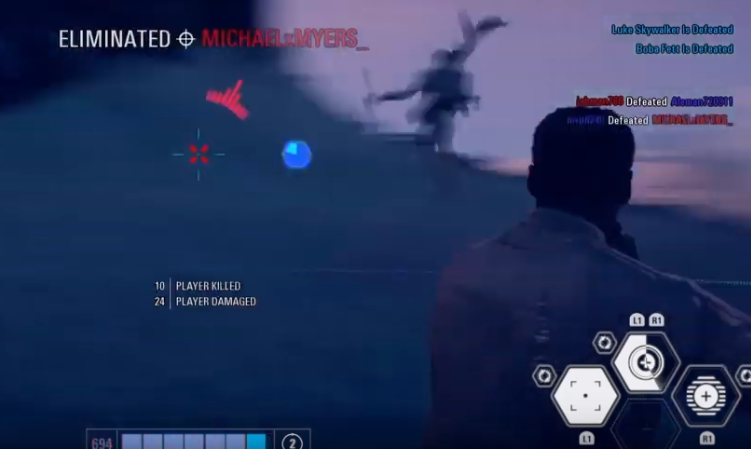 Yoda also has access to a dash saber ability similar to Maul & Luke (although Yoda's cannot be blocked), as well as having decent overall speed and mobility. Yoda lacks any healing ability, but he does have access to a powerful preemptive health buff which benefits both himself and those around him which slows decreases over time. Yoda is most effective as an anti-infantry/blaster villain character who can hold and push objectives well against everything except committed Sith villains. His best uses are pushing the line of engagement against hordes of enemy troopers and using unleash to one shot kill entire groups of them at once (hence the reason I have that ability upgraded). My record is 8 kills in a single unleash use on the stairs of Starkiller base. In general you will want to remain as mobile as possible and use his dash repeatedly through enemies to kill them (I only use his regular saber attack if I somehow flank someone) while also soaking damage and unleashing whenever possible and keeping his presence buff up. The principle caution for playing Yoda is that you do not want to get involved in fair fights with the likes of Vader, Kylo, or Emperor Palpatine. 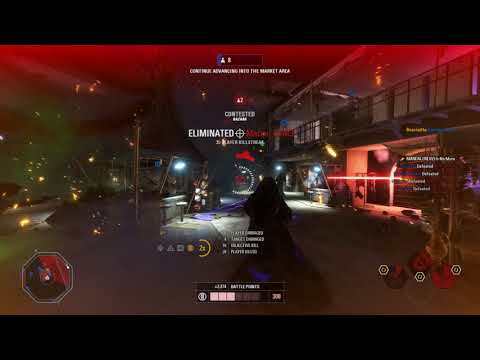 For Vader and Kylo, since you cannot block (or even dodge since patch), your best bet is to use dash attack and your mobility to harass them and try to stay away while you and your team whittle them down. For the Emperor, his force lighting will overload your absorb very quickly leaving you a sitting duck... best to retreat and fight another day after hitting him with Unleash. Finn is a solid choice to round out the top 4 GA heroes. 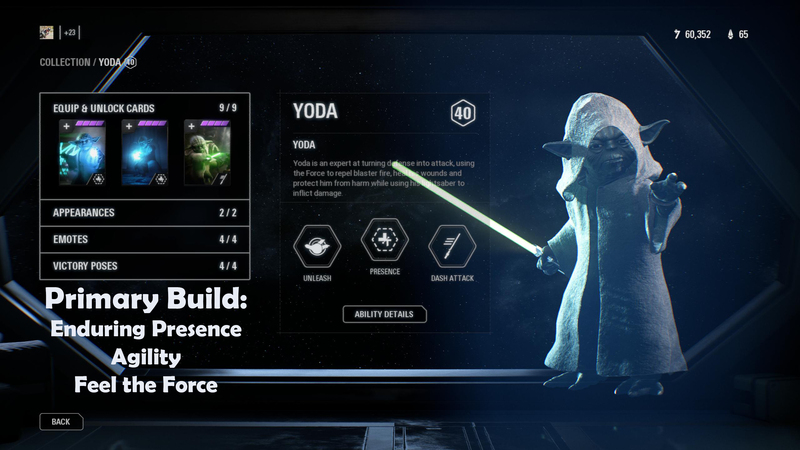 His "Big Deal" aoe health/cd/damage reduction/recharge time is incredibly powerful and synergizes well in particular with Yoda’s “Presence”. 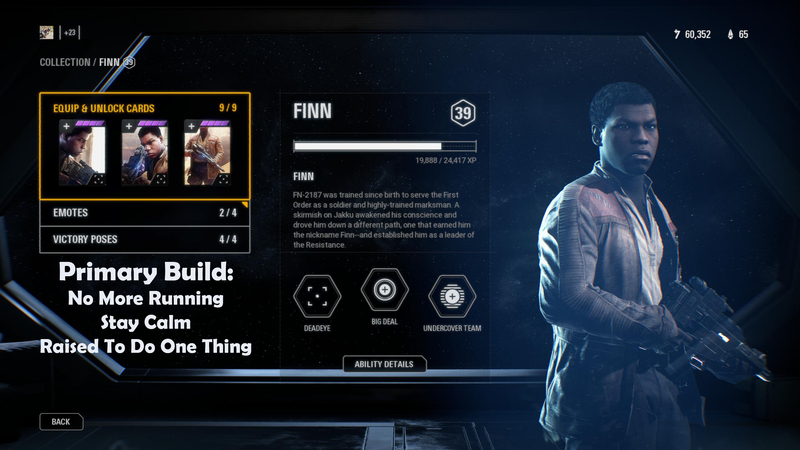 His "Undercover Team" is another great group and self-buff which is basically a poor man’s version of Rey's "Insight" while also buffing his team with stealth and sprint... but the real gem of Finn is his "Deadeye" ability. Once fully upgraded, this ability is an absolute wrecking ball (even after its nerf), as it is a literal aimbot courtesy of DICE. 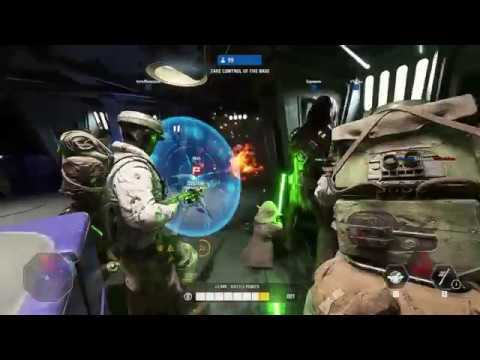 This ability can easily guarantee tons of easy kills if you are in a crowded area... and absolutely wrecks soft villains such as Palpatine and Bossk. If I were to give advice on how to play Finn, it would be to stick with your team just behind the front lines, provide them with AOE buffs, and then move into the front every time "Deadeye" is up and absolutely wreak havoc... or whenever Palpatine shows up if he is on the battlefield. The biggest caution I would give for playing Finn is that similarly to Leia, he is vulnerable if a saber Villain can get into melee range, so be sure to be aware of your surroundings, play him like you would Leia, and you will have massive success with him in GA. I still believe Leia is slightly better than Finn just because of her varied ability set and the fact that her sniper capabilities are basically automatic, but Finn is certainly a force to be reckoned with. I hope this information has been helpful to anyone starting out/struggling in Galactic Assault, or people who are just interested in starting to upgrade a new hero/villain and are unsure where to begin. 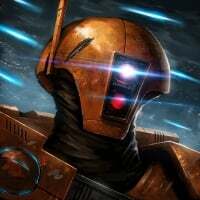 I would like to also thank everyone who provided feedback on my previous versions of this list as it helped me immensely in shaping this updated list as well as even causing me to make a few changes this time around in both some build details as well as the formatting of the post itself. Lastly, while these builds may work for other modes such as HvV, these are specifically based upon Galactic Assault gameplay… if interested in builds for other game modes, I would suggest looking up guides for those modes specifically. I do not plan to update this guide further, as the difficulty of attaining Star Cards is exponentially easier and thus the importance of upgrading the correct heroes/villains with the correct cards is greatly diminished. Hence the reason I won't be doing any further versions... it is so easy to get cards now that it isn't really a big deal if you pick a bad one on accident. I keep telling my wife... every job I do is excellent! A LOT. And rightfully so. Games fun, Skill won’t go away/decline. Stay sharp and lethal! Great post as usual dude! Extremely informative and well written. At this point an hour or two a day, some days I don't if I am busy with work. The game launched at a time of the year when I am not very busy so i was able to put in mountains of hours for the first 6 weeks or so before I had to back off due to RL commitments. Great list, t3hBar0n, I agree with your Villains list and I'm also glad that Iden is a more viable choice now with her getting a health on stun card. For the heroes and for me personally, I'd put Finn together with Luke. I think Luke is highly underrated by most players, and the claims that he's worthless or on par with Kylo Ren isn't particularly true in my experience. Just by him being able to heal by getting kills is enough to put him on the upper tier, and I believe his hit and run tactics can work to your advantage with some map awareness. Not saying that he doesn't need buffs, because he certainly does, but I found picking him more often as of late compared to Rey, as she's very easy to do good with, due to her inherent wallhack ability, and he's much more of a challenge to play well with. Thanks for the guide. It should help the newcomers out on what to focus on. I wish the game had a more intuitive combat system. Hopefully this is addressed in BF3. Would like to see things like more damage but defense be more effective. both luke and kylo are better then people give them credit for even if there is better picks most of the time. Expect him to be nerfed soon. I just wish we could get games like this regularly. It's not Palp is OP, no. buff palpatine. t3hbaron is OP. nerf t3hbaron. on a more serious note, I'd vote t3hbaron one of the best! i never get more than 10 kills as palp. get most kills with at-st, yoda, and maul lol. I am good, but I know for a fact there is at least 136 players who are at least as good as me if not better because I have fought them and then added them to my friends list because they gave me problems lol... and there are countless more who I have yet to run into who would likely do the same and that is just on PC which is a small platform... unfortunately we will never know until we get private matches. All day one players that arrive salty, need to be following th3baron. His guides will show you the way. Gittin gud is easier with a teacher. I'm not sure what you mean by a "more intuitive combat system". I do a lot of staff development, so I just like to do tutorials/instructions for people, whether professionally or in a video game haha. I came home from work today straight into using palp ... one kill and then died. back to the corner with tail between my legs. Add me and jam with our group, I’ll peel myself away from Bossk and drop some hundies. Haha no worries, I have had many games where that stuff happens. Don't get in fair fights with anyone... if you start taking significant damage just turn and run... dont go for the kill, run/regroup and come back with more lightning for them! looks like palpatine isnt gonna be best villian anymore. I will hold judgement... he has been nerfed in the past and remained a phenomenal villain despite that. It looks like the principle focus of the nerf will be on his regeneration rate... this is fine and really won't have much of an impact on good Palpatine players and is one of the easier nerfs to work around with modified gameplay as long as it is not completely drastic. Palpatine's ''Lightning Absorption'' card is getting nerfed, according to F8RGE a few minutes ago. Can't' say that'd be the only nerf Palpatine would get, but this one more specifically is what is being worked / discussed on at the moment. sigh really dont think he needed a nerf but a nerf to his healing is fine I guess. I wonder if its gonna be heal on kill now. They could reduce his base regen (I think it was fine originally). They could reduce the targets hit by chain lightning by default (right now I think it is 6). They could reduce the amount of healing gained from each chain lightning hit. They could change the mechanic to health on kill instead of health on hit with chain lightning. Or a combination of any of those things. TBH I never had a problem with Palpatines regeneration/health even at release due to his ability to heal, so it will be interesting to see what route they end up going. I don't foresee it having a large impact on his functional gameplay for people who are good at playing him unless it is coupled with nerfs to his damage/range as well. And here is our answer... the poster stated "they'd better tone down his Lightning Absorption Card." If they want to tone down his regeneration, they'd better tone down his Lightning Absorption card. I'm fine with this, this should not functionally change how he plays in the hands of good players in any way. yep, was just worried earlier since they overnerf stuff a lot of times. they'll probably touch his lightning range too, since everyone complains about that. I don't really have a problem with that being nerfed... the only other nerf I would say might be justified is to reduce the number of players hit by the default chain lightning... right now I think its 6 at least default, making the star card that increases the number hit nearly useless. If they dropped it to say 3-4 by default, than that card might be more appealing at least for GA. Excellent OP again @t3hBar0n - thanks. Thanks, hopefully Luke will vault into the mix next patch. Indeed but to be honest in GA I think the mobility and health regen on Palp are still the biggest problem. A relatively low skill player can still completely turn the game almost single handed and that doesn't seem right. Change his his health card, which is wht their doing, and hes fine. Luke is definitely in the mix for best heroes now, probably 4th or 5th. Build I am running is increased push area, healing on kill, and the 3rd dash card. Canny guide. 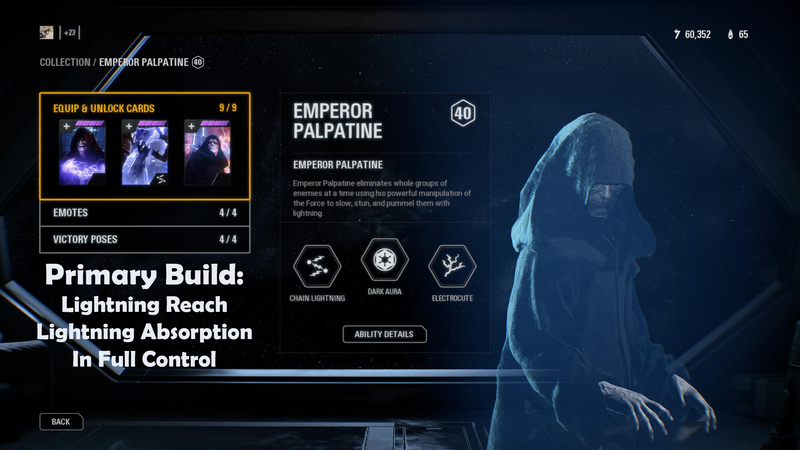 Would you say Palps is knocked off top spot with the recent hotfix issues? 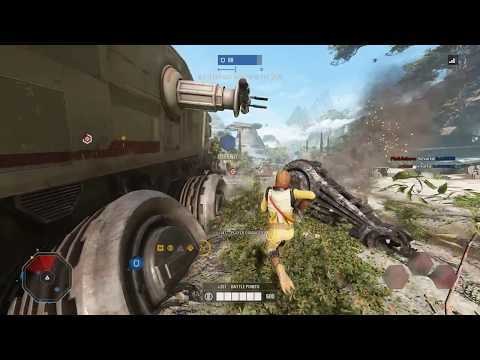 I find Bossk to be the perfect all-rounder on GA, he can hold areas with limited entrances single-handedly. 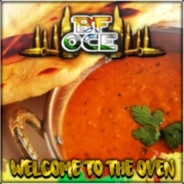 The guide is legit...why? There is no Luke in it...he is just so useless...so no point of a guide. But he can be used well when you have a squad. For GA I would say health regen plus both pushes - same on HvV on maps with edges and non-edge maps replaces push cards with both saber spin cards. Nice guide. However, I'd put Maul above Vader for GA, just because Vader is so slow and easy to hit, while a good Maul player is a tough target, and does just as much damage. All his abilities are currently bugged, even basic lightning. Maul loses points because he cannot engage enemy saber heroes toe to toe, he cannot hold/capture objectives effectively due to his poor defensive abilities, and he has no sustain as he lacks any heal ability. For these reasons he is significantly less effective in GA than Vader is. Vader is capable of carrying a team to victory against heavy opposition including dispatching multiple enemy heroes simultaneously... Maul on the other hand is a skirmisher/assassin who is good at taking out 1 or 2 troopers at a time, but whose effectiveness quickly diminishes as resistance becomes more pronounced. Due to palpatines bugs he is currently not worth picking in GA whatsoever... assuming those bugs are resolved his position will remain the same... for the moment bossk is unquestionably the best choice followed closely by Vader. Who is the 5th hero on the light side? Luke? Yes... at the time this guide was written he still hadnt been buffed. He is now 5th for heroes. 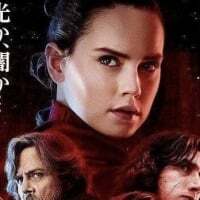 Bump to the top... Palpatine is back, and I still pretty much utilize this same list with the addition of Luke which has been noted earlier in the thread. This seems pretty solid for GA. I can't really disagree with any of this tbh! (Although granted, I prefer a wider, thicker Dioxis Grenade over trap arming for Bossk due to the "Stick to walls, poison everyone inside" thing it has going for it." Do you have any similar idea for HvV and Showdown? The latter is quickly becoming my favourite Hero Mode; Mainly due to lacking a precise 4 man premade atm. Nah I don't play HvV so I cannot comment on that. As far as the "thicker" dioxis grenade... it doesn't functionally do anything... it doesn't increase damage at all last time I checked.